For nearly 500 years, after Portugal first established their colony on the western side of the Pearl River Delta, Iberian and indigenous Chinese traditions have evolved alongside each other, creating a way of life in Macao that is so utterly unique that there is no other like it, anywhere on Earth. It is my love for this individual culture and history which has continued to lure me back from my home in Hong Kong, time after time, for over 20 years. I visit Macao precisely because it is not Hong Kong. It doesn’t look like it, it doesn’t act like it and, very importantly to me, doesn’t taste like it. 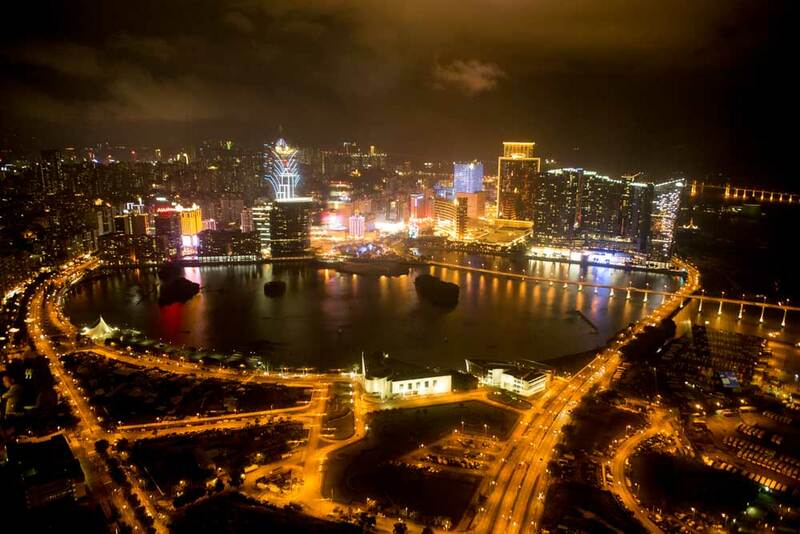 But, Macao does not get a fair shake in tourism circles; slogans like “The Las Vegas of Asia” have been branded, literally and figuratively, into the subconscious of the traveling public and their travel advisors. 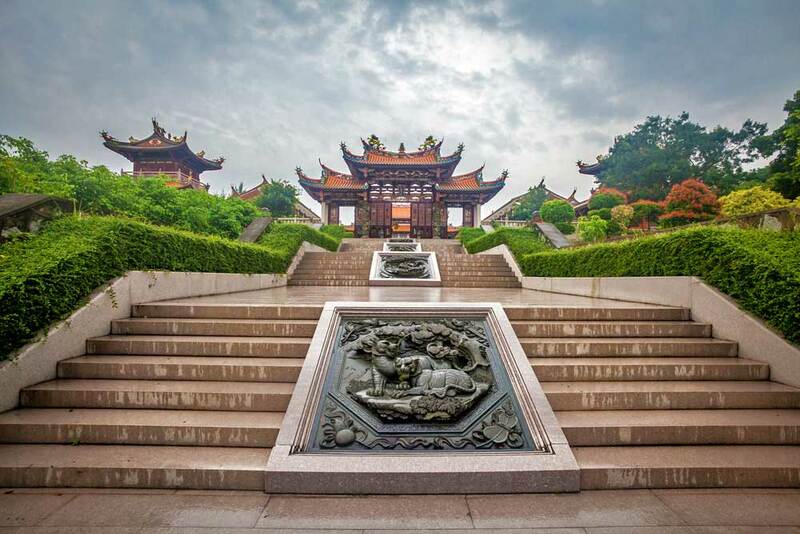 Yet, unlike Las Vegas, which sprang up out of the desert less than 200 years ago, and is known for little else than a century of casinos and gambling, the origins of Macao trace back to the Qin dynasty of 221 to 206 BC. The seeds of the Macao we know today were sown in 1535, when Portuguese merchants were first given permission to drop anchor and establish a permanent settlement, in order to develop trade relations between the two nations. This was over 300 years prior to the British Empire’s possession of Hong Kong in 1842, so while it may have the greater reputation, Hong Kong is a young baby compared to its neighbour across the Pearl River Delta. 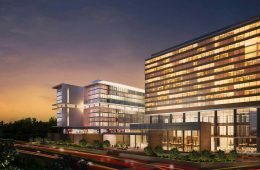 One major benefit brought by the growth in gambling on the Cotai Strip is the upsurge of so many of the world’s most prestigious hotels opening properties in the region. So much so, it is now possible to stay in the very best hotels while enjoying the richness of this fascinating and surprising peninsula, and its neighbouring islands. In turn, the arrival of the world’s finest hospitality brands led to the explosion of international gastronomy in Macao. 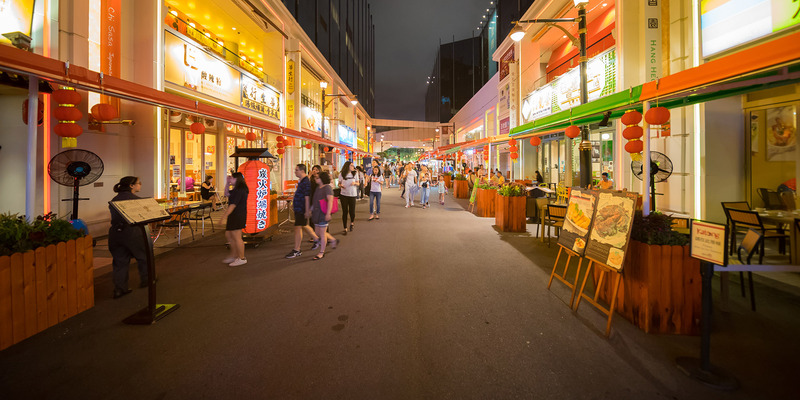 So, alongside the famed fare of the Portuguese and Macanese restaurants, that have kept people like me coming back regularly for decades, Macao has become home to some of the best establishments on the planet, offering every type of cuisine you can imagine. Indeed, as I write this, there are now 19 restaurants with one or more Michelin stars, thriving in a location where it takes less than an hour to walk across its entirety. Here are my reasons why you should visit Macao, and instead of making it a day trip, why you really should stay the night. 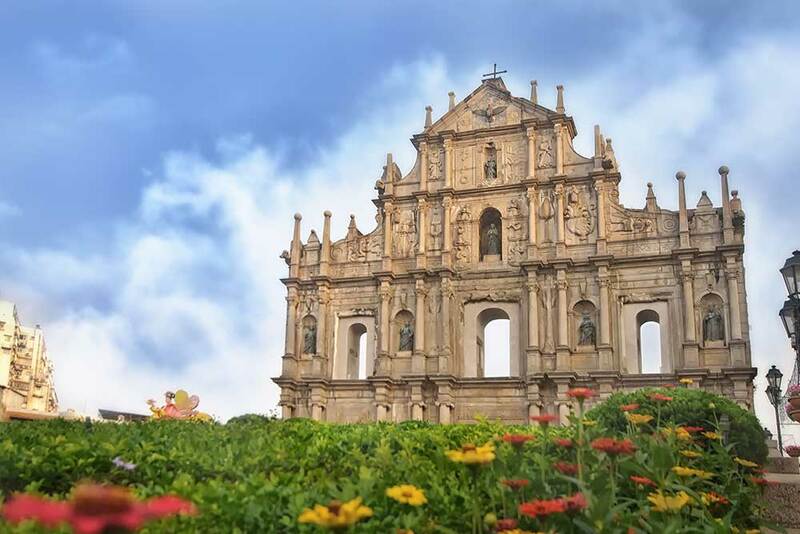 Macao doesn’t just have a UNESCO World Heritage Site; it is a UNESCO World Heritage Site. 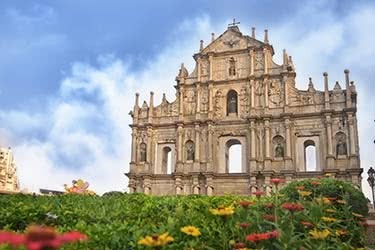 The Historic Center of Macao – which takes up much of the peninsula – has remained intact for a very long time, and provides a unique look at how the meeting of East and West has developed over nearly five centuries. In stark contrast to Hong Kong, famous for burying its history under new skyscrapers, Macao has done the exact opposite by celebrating the past as well as its future. There are very few places that can boast such a pristine window into days gone by. A visit to Macao must include a walking tour of this entire area, where I advise you carry a camera, make sure to take your time, and seek out the many architectural treasures that can be found here. I like to check out the alleyways; they often lead to interesting and unexpected little areas, like quaint public gardens and tiny civic squares – I find there is great satisfaction to be gained in these little discoveries. You won’t get lost, but you can certainly lose yourself as you follow your nose through these captivating back streets – especially, if like me, you like to stray off the beaten path. As you wind your way through old Macao you will see some breath-taking buildings, such as the 16th-century Leal Senado Building (Portuguese for Senate Pavilion) which served as Macao’s first seat of government and has, over the course of its life, been a post office, a museum and even a prison, before becoming a government office once again. Another picturesque point of interest is nearby Senado Square, which features Portuguese cobblestones that, for a moment, almost fool you into thinking you actually are in Lisbon – until the dulcet tones of spoken Cantonese bring you back to China, that is. 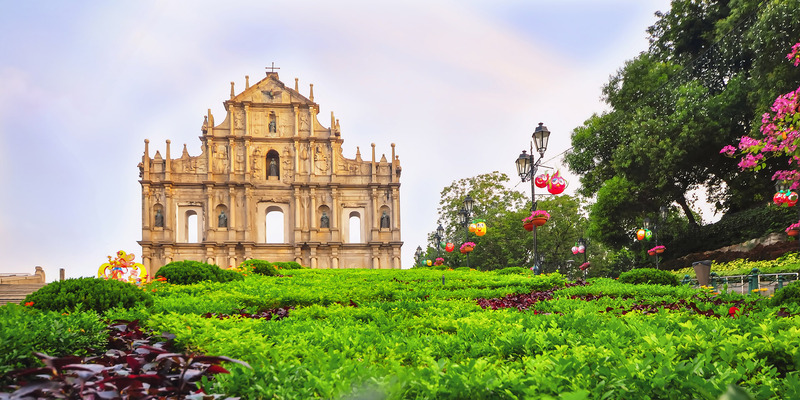 Macao’s most famous landmark is the lone façade of the Ruin of St Paul’s, the remains of a 16th-century Catholic Church. Although certainly impressive, I do recommend visiting the museum at the Monte Fortress first. 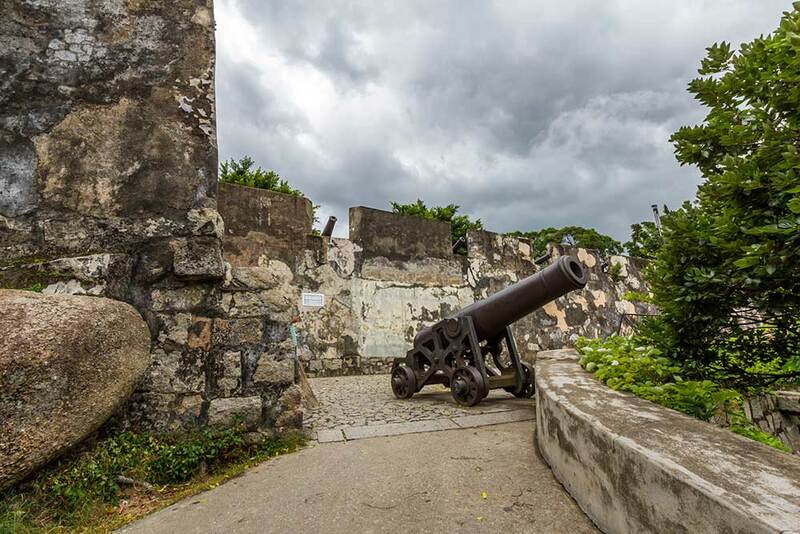 Here you can see the original fortifications that protected the first Jesuit settlers from pirates in the early 1600’s, as well as visit the Museum of Macao, which will helps put everything you see in the Historic Center into context. 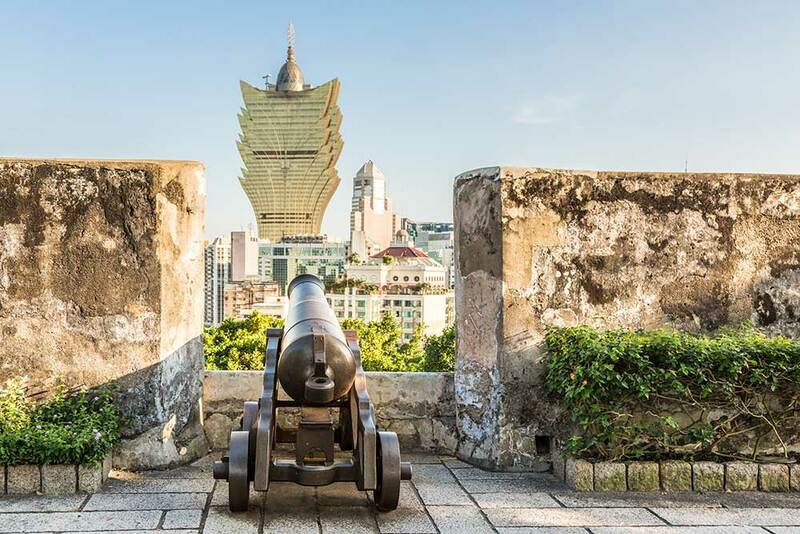 If you are feeling mischievous you can look down the barrel of one of the cannons and wonder why it seems to be pointing directly at the Grand Lisboa Hotel! If possible, don’t just stay in Macao. Towards the south, and across a choice of three fine bridges, lies Taipa, and beyond that Coloane. 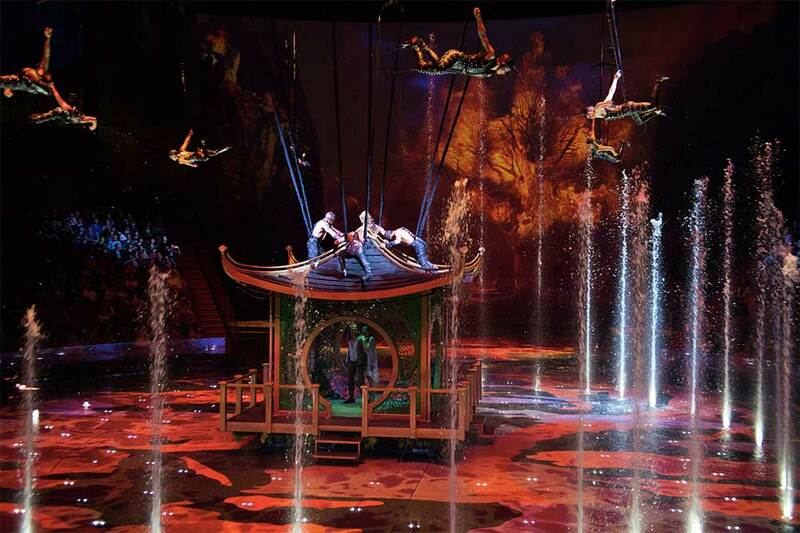 Originally these were two separate enclaves, but when someone had the bright idea to fill the channel between them and create one island, it began a radical transformation which culminated in the creation of Asia’s entertainment capital – The Cotai Strip. 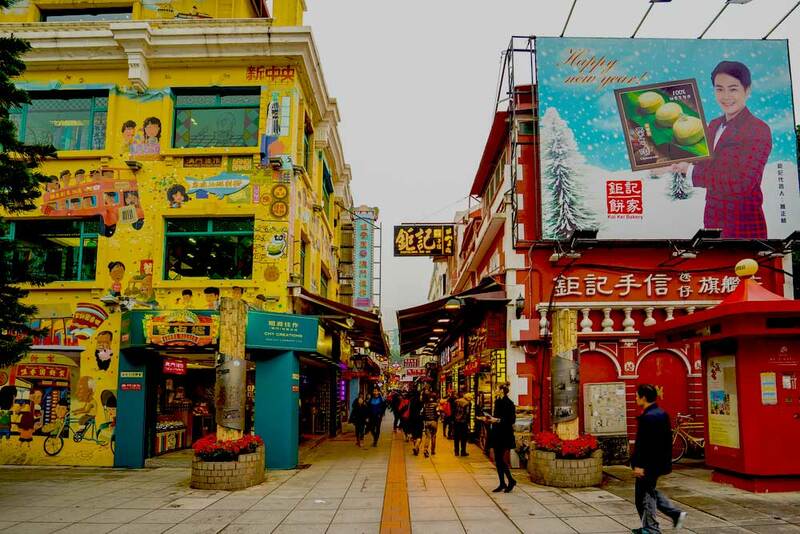 Once in Taipa, head to Taipa Village where you will see another slice of old Macao. These narrow walking streets exude character and are home to many fine restaurants, some of which have been there for generations; I particularly like the old Taipa Houses, built in 1921 to house senior civil servants. You can also take a wander down Rua do Cunha, packed with old restaurants and a bustling Sunday flea market, full of trinkets and curiosities; this energetic street is the beating heart of Taipa Village. Antonio, my favorite restaurant in Macao – lauded for its piquant Portuguese dishes – is just two minutes’ walk away. Finally, do not miss out on Coloane. This is Macao’s green lung and offers hiking (notably to the A-Ma cultural village), beaches and golf, if you are so inclined. Coloane is also the home of my second favorite restaurant in Macao, Fernando’s, as well as being home to the illustrious Lord Stow’s Bakery – the place to get Portuguese egg tarts – which can be found in Coloane Village. A quaint little town, Coloane Village is centered around the village square – known as the Largo do Presidente Antonio Ramalho Eanes – which features a small statue of Cupid. If you go down to the waterfront you will see a stretch of water about 650-feet wide. The land on the other side? That is mainland China! Macao has something to offer all kids, young and old, and all of my favorite hotels below have excellent facilities for children and do not, themselves, cater to gaming. If you do not want your children to be exposed to gambling it is very easy to avoid, as under 18’s are expressly forbidden from entering all casino floors, and protective screens mean they won’t see anything. Along with all the cultural highlights introduced above, ripe with memorable photo opportunities, there are also some specific experiences that I think are perfect for families. The first one is The House of Dancing Water. No matter where you are from, and no matter what you have seen, this will be one of the most spectacular expositions you have ever witnessed. 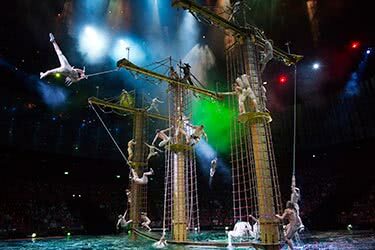 With a story that opens with an entire sailing ship rising up from the waters of a 3.7-million gallon pool, and supported by an 80-strong international cast – who perform mind blowing stunts and some vertigo inducing high dives – the logistics alone are mind-boggling. 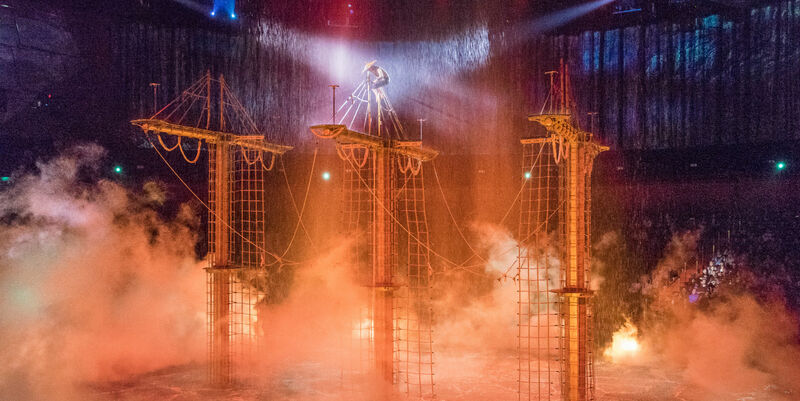 I was fascinated at how in one scene the stage was a deluge of water and then, only moments later, in the next scene the stage was bone dry. I spent 90 minutes wondering how deep the hole in the ground must be to fit everything in. This show is an absolute must see. The Macao Tower offers thrills and spills. 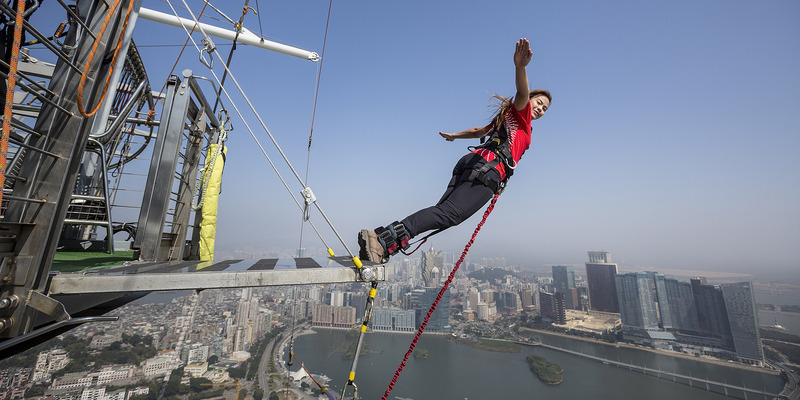 Thrills, because of the 360-degree view from 1000 feet in the air, and spills because you are invited to throw yourself off the side on the end of a bungee cord. For the slightly less daring, you can promenade along the Skywalk – circling the top of the tower and back again. Be warned though, there are no railings, you are at the mercy of your safety line. If your younger children are pining for some familiarity after being away from home for a while, the DreamWorks Shrekfast is something to consider. I won’t say it is the best breakfast buffet you’ve ever had, but they will see all of their favorite characters including Shrek, Kung Fu Panda, and Puss in Boots in a show that will definitely keep them smiling. You will laugh as well, but try to contain yourselves – remember this for the children! There are so many incredible places to eat in Macao. From incredible street food vendors to the glittering array of Michelin star restaurants, as well as those restaurants which have received honourable mentions in the revered food guide and the many kitchens run by chefs who have earned stars from previous restaurants – it is not possible to go hungry here. While you are exploring Macao, you must try a pork chop bun. This is simply a pork chop wedged into really good crusty bread. If I am in Macao I will have one of these without fail, and I would quite happily skip the hotel breakfast to chow down on this local speciality. 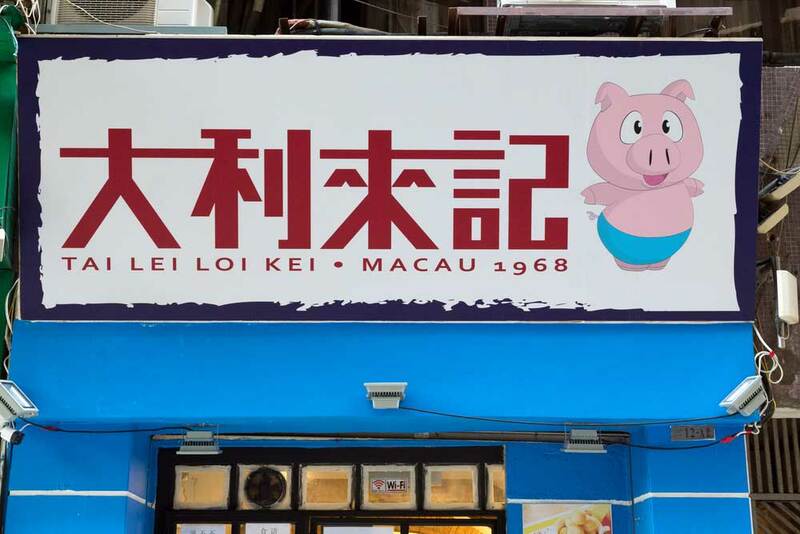 My number one place to buy a pork chop bun is Tai Lei Loi Kei, in Taipa Village, just a short walk from Cotai. I have already mentioned the Portuguese restaurant Antonio, and Fernando’s, the maestros of Macanese flavours, as my first and second favorite restaurants respectively. However, some of the very best Chinese food can be found in Macao too. Jade Dragon, at the City of Dreams in Cotai, has two Michelin stars and is, to my mind, one of the best Chinese restaurants I have ever eaten in; somewhere you simply must try if you love southern Chinese cuisine. When I first came to Macao there was only one choice, The Mandarin Oriental, and while the bar there was one of Macao’s more interesting night spots, the hotel itself was not the greatest example of the Mandarin Oriental brand at the time. 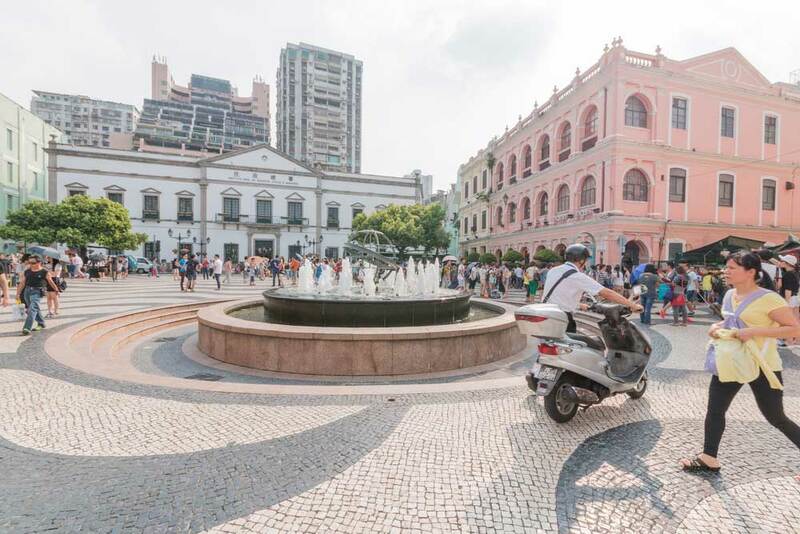 That property has now disappeared, replaced by a shiny new tower, containing a thoroughly modern, 21st-century luxury hotel, just 10 minutes by car or a pleasant 20 minute walk to Senado Square and everything historic Macao has to offer. Inside, I am particularly fond of the Vida Rica Bar, as it has two things I particularly love. First, a fabulous Mojito – my weakness for great rum is no secret – which they call the Millionaires Mojito, where the concoction is taken up a notch with the simple addition of champagne; I would love to meet the genius who managed to improve upon what is already my all-time top tipple, and shake them by the hand. Second, it has an astonishing view. 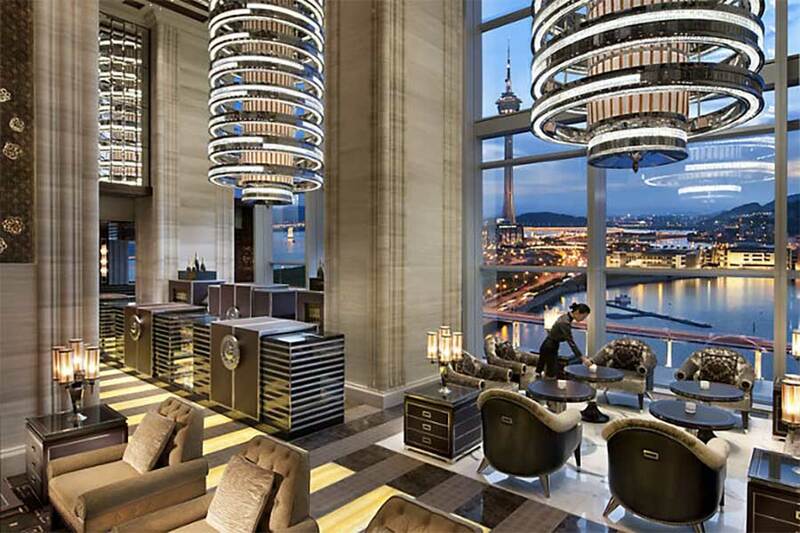 The bar enjoys two-storey floor-to-ceiling windows, making it all-too-easy to lose track of time as you gaze out onto the vivid luminescence of Macao’s night time skyline. My second pick is the St. Regis Macao in Cotai. The St. Regis Macao is part of the Sands Cotai Central Development and shares the block – I say block, it’s actually a huge entertainment complex – with the Conrad and Sheraton Hotels. The rooms and service live up to everything that a St. Regis hotel promises, but without doubt the unique selling point of this hotel is the butler service. While not an uncommon service in hotels of this caliber, it is done supremely well here. Whether you need a quick shoe polish and your shirt pressed for the evreening, or last minute tickets for a show, call your butler and he or she will make it happen. If you are staying here, then a short walk through the complex will lead you to Xin. Xin is a Chinese hotpot restaurant par excellence. If the locals want to eat out, they love to eat here, which is the greatest recommendation I can give. If you go, make sure you go hungry. My final pick is the Ritz-Carlton, and I will go on record to say that this is my favorite. I have always had a personal love for this brand, and my wedding reception and wedding night were spent in the original Ritz-Carlton in Hong Kong. It is my connection to this specific hotel that made me fall in love with the Ritz-Carlton in Macao. 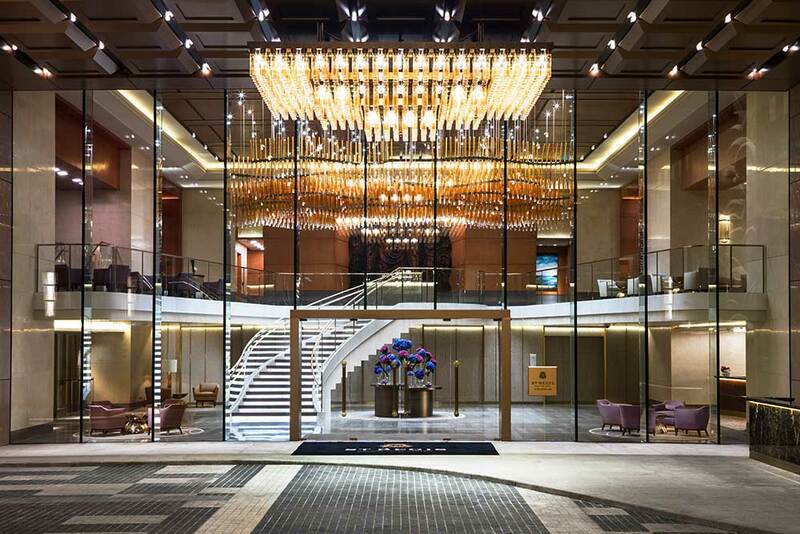 While a very different building on the outside, stepping into the magnificent lobby you cannot help but recognise many elements from the original. This is an all-suite hotel, and even the smallest accommodation covers nearly 900 square feet. 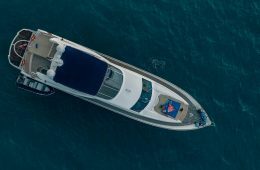 The suites are beautifully appointed, bristling with technology ordinary people can operate, and capped off with some magnificent views across the Cotai Strip or Macao. Though they have a reception desk, up on the 51st floor, you will be taken straight to your room to check in. However, it is worth heading to the 51st floor anyway, because it is there you will find the Ritz-Carlton bar. If you like a gin and tonic you will adore it here, as staff will bring the trolley to your table and craft a G&T that will send you into raptures. Just beyond the bar is Lai Heen, a stunning Cantonese restaurant, which deserves its recently awarded Michelin star. Its interior is so truly breath-taking that it even competes with the view from the windows. 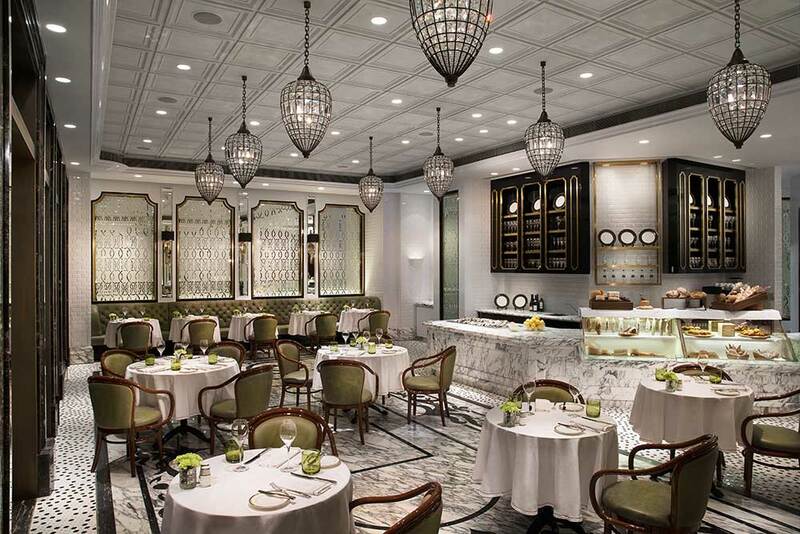 However, for me, special attention must be given to the Ritz-Carlton Café, located on the ground floor. It captures classic French café culture to a tee, and is designed to be just like the original Café at the old hotel in Hong Kong – one of my preferred lunch and dinner spots now, sadly, lost to time. But it is not just nostalgia for more simple times that makes me love this café. Not so long ago, I took my wife here for steak frites for a little treat, two days after her birthday. Without any prompting from me, the Manager wished my wife a happy belated birthday, and gave her a card signed by the entire café staff, front and back of house, along with a huge chocolate cake, complimentary of course. Things like this really touch your heart and create a lasting bond between an establishment and its patrons. No matter how pretty the hotel, how efficient the service, or how delicious the food, nothing compares to gestures like these. These are just a few of my favorite things about this amazing destination, but Macao has something for everyone. Whether you are a high-roller seeking the thrill of the green baize, a family group seeking wholesome fun with a VIP backdrop or an adventurous gourmand with an appetite for new flavors, this forward-looking city provides a myriad of different options guaranteed to satisfy. With so many interesting areas to explore, exciting things to see, and incredible foods to eat, it is impossible to even begin to understand everything it has to offer. You really need to spend a night or two to do this magnificent town justice, to create an unforgettable Macao experience and to make a start on your own Macao must-do list. Phil Ingram is the Vice President, Marketing for Remote Lands. He has lived in Hong Kong for nearly 25 years and is a keen traveler and photographer. Outside of work he loves to spend his time behind a drum kit, in the kitchen, or on the ocean holding a paddle.